CONGRATULATIONS TO TWO OUTSTANDING SCHOLARS/ATHLETES!!! MATT FRANCO FOR 2016 RECEIVED..
ALEX WEED FOR THE 2ND YEAR IN A ROW RECEIVED..
RECOGNIZING ONE OF OUR OUTSTANDING PLAYERS ZACH OWENS PICKED FOR..
AND SHANNON QUINN SIXTH TEAM!!!!! Go to https://formreleaf.com/organizations/north-penn-high-school, click "SIGN UP" at the bottom, left corner of the page and create an account. DISTRICT ONE CHAMPIONS!!!!! AGAIN!! 4TH TIME IN A ROW!! CONGRATULATIONS BOYS SWIMMING AND DIVING DISTRICT ONE RUNNER-UP!! It is with deep sadness that the North Penn Swimming community annouces the passing of Joe Szabo, a team parent and creator of this website. Joe was passionate about Swimming and Water Polo and was dedicated to sharing the success of this program through both web and news outlets. He will be deeply missed. Services for Joe will be held Saturday Feb 13 at Christopher Mennonite School starting at 1PM. More information can be found here. GIRLS & BOYS WATER POLO ATHLETES OF THE YEAR 2015!!!! Once a Knight always a Knight. Three former NP Knight swimmers meet up again at the West Chester University Golden Rams Classic Tri-Meet, swimming for their respective colleges. Pictured: Stephen Kolokithias freshman Albright, Kyle Supko freshman West Chester, Spencer Collopy junior Ursinus. North Penn Water Polo is Currently looking for enthusiastic individuals to coach boys and girls water polo ages 7-12 & 13-18. Experience playing water polo is necessary; coaching experience is preferred, but not necessary. Please email letter of interest & resume to Jason Grubb at grubbjt@npenn.org and/ or Katie Grunmeier at grunmeka@npenn.org. Please respond by December 20th. Congratulations Boys Water Polo 2nd Place PA State Championship! NP Boys Middle School State Champs! AMERICAN WATER POLO SCHOLAR ATHLETE!! CONGRATULATIONS TO THE JV BOYS!!! 2015 BEAST OF THE EAST CHAMPS!!! CONGRATULATIONS TO: AIMEE BAUR, ERIN O'NEILL, & SHANNON QUINN 1ST ALL TOURNAMENT TEAM SELECTIONS. LEAH BROWN 2ND TEAM SELECTION!! OUTSTANDING ACADEMIC ALL-AMERICAN AWARD RECIPIENTS 2014-2015!! PA State Championships - Maidens 3rd!! !, Knights 4th!!! - results coming soon. North Penn Knights and Maidens are District 1 Champs!! North Penn Dominates at District 1 Meet! Marie Yacopino captures District 1 Title! Breaks District, NP Pool & NP School records!!! Joined by Madison Tanis and Rachael Fisher on the trip to States! North Penn's Ian Boland-Bintner Captures Boys AAA District 1 Title ! No parents allowed on deck during the diving championship. Congratulations to the Boys and Girls swimming and diving teams!!! Yacopino, Mitchell lead NP's Dominance of SOL Continental Diving Championships! NORTH PENN defeats Emmaus, stays undefeated! North Penn stays unbeaten with wins overs Souderton!! NORTH PENN shaping up well for Districts! What a wonderful senior night hosted by our underclassmen families! Knights & Maidens stay unbeaten with wins over Souderton! NP Knights & Maidens stay unbeaten with wins over Souderton! WAY TO GO KNIGHTS & MAIDENS!! CONGRATULATIONS 2014 PA ALL STATE SELECTIONS!! Congratulations to ALL Conference Team Selections!!! Undefeated North Penn Knights host PA State Water Polo Championships. NORTH PENN MAIDENS WIN STATES!!! Awesome season for the Knights & Maidens! There is still alot of water polo yet to be played. For planning purposes attached is the 2014-2015 Swimming Schedule from PIAA. Keep a look out for an email from the coaches once water polo season concludes. We are... NORTH PENN!!! Huntington Beach, CA - September 5 - USA Water Polo is proud to announce the 2013-2014 Academic All-Americans. Congratulations to all the athletes recognized for their hard work in the classroom. Student-athletes needed a 3.6 GPA on a scale of 4.0 to qualify, those that received a 4.0 GPA were honored as outstanding achievers. for achieving Outstanding Academic All American (GPA of 4.00 or higher)!!!! NORTH PENN KNIGHTS are the Beasts of the East !!! Congratulations Boys on a great tournament and for the win over Greenwich ! NP MAIDENS - runners up for the Beast of the East! Great job girls !! ALL AMERICAN ACADEMIC SWIMMING RECOGNITION !!! Julie Krout, Tara Rogers, and Aaron Sisko!! Marie Yaccopino, Jeffery Gagnon, and Ian Boland-Bitner!!!! Way to go!! North Penn Proud!! During the March 20 Action meeting the Board of School Directors honored several members of the North Penn High School athletic teams and clubs for their accomplishments at the district and state levels. Aimee Bauer, Leah Brown, Olivia DiStefano, Kailyn Evans, Heather Hartmann, Julie Krout, Caroline Miller, Erin O'Neill, Kat Perkins, Shannon Quinn, Tara Rogers , Madison Tanis, and Marie Yacopino! Ian Boand Bitner, Brett Else, Harrison Friel, Geoffrey Gagnon, David Grove, Shane Hennessey, Bryce Hoch, Alexander Holland, Aaron Jordan, Liam Kelly, Mike Kern, Thanas Kountroubis, Jonathan Krail, Quinn Mitchell, Greg Neidlinger, Cole Palumbo, Jacob Schellinger, Aaron Sisko, Corey Smith, Kyle Supko, Ryan Yocum! Best of luck to the 2014 State Team !!! 10th D1 title all time !!! 2014 BOYS DISTRICT 1 CHAMPS !!!!! 30th D1 Team Title, Congrats !!! Good Luck to All North Penn Swimmers!!! NP's Yacopino, Gagnon sweep SOL Continental Diving! CONGRATULATIONS KNIGHTS AND MAIDENS SWIMMING AND DIVING TEAMS FOR AN UNDEFEATED SEASON!!! CB West meet rescheduled to Friday 2/7/14 at 3:45 at North Penn High School. Go Knights and Maidens!!!! Please note time change for the Souderton meet it is now 4:30 PM start. On 1/23/14 at North Penn. See you at the pool !! Go Knights and Maidens!!! as a Commended Student in the National Merit Scholar Competition!! A scholar and an athlete!! 1st day swim team practice. Nov 18th - 5:30 am and after school. All forms must be handed in on first day of practice. CONGRATS GIRLS - AWESOME IS AS AWESOME DOES - YOU DID IT!! GOOD ON YA, COLIN !!!! WAY TO GO BRIT and JENN !!!! All physicals must be dated after June 1, 2013. Check Out the North Penn High School Swimming and Diving page on FaceBook - Cool Pix and Links to Local Newspaper Coverage of your favorite Knights & Maidens! Gagnon places 5th at Districts, qualifies for States! Locals hope to dive into States! Knights and Maidens Swim to Conference Crowns! Gagnon wins SOL Diving Title! Emily Kosten breaks 31 year old team record!!! on the March 8 Date ! Coach Rick Carroll Honored by Montgomery County Coaches Hall of Fame!!! Among five coaches in the 11th class of those so honored, Coach Carroll was inducted at the Montgomery County Coaches Hall of Fame annual induction banquet on Tuesday, October 9 at Westover Country Club in Jeffersonville, PA. Rick Carroll was recognized for leading the North Penn swimming program to status as a statewide powerhouse. A Hearty & Sincere Congrats to Coach Carroll !!! We are thankful for his ongoing support of NPHS Swimming & Diving. Coach Carroll often attends NPHS home meets, offering advice to coaches, inspiration to swimmers & divers and encouragement to families. Coach Carroll likes to keep a low-key, unassuming, discrete profile but he’s easy to spot in the stands as he offers a friendly handshake and smile to many of the NP alum as they attend meets (in the natatorium that proudly bears his name...and we wouldn't have it any other way) ! Good on Ya Coach Carroll !!! 10/29/2012 Maidens are State Champs Again!! 10/27/2012 Congratulations NP Maidens - PA State Champs!!! 10/9/2012 NP Alumni News: Zac Nees - Working On A Dream! 10/1/2012 North Penn Proud! Big Time Academic Congrats to Colin Kelly, Alyssa Tate and Aspen Trautz as they were among 15 North Penn students that were recently recognized as Commended Scholars in the 2012-13 National Merit Scholarship Competition! Colin, Alyssa and Aspen were among the Top 5% of more than 1.5 million students who entered the competition by taking the Preliminary SAT/National Merit Scholarship Qualifying Test (PSAT/NMSQT). for the latest Water Polo Schedules, Results and News! 3/16/2012 Deana wins GOLD at States!! 3/15/2012 Silver for NP's Deana at States!! Deana gets Silver at States! 2/18/2012 Knights roll at home behind Dunigan's pool record! 2/18/2012 NP Boys roll to another Conference Title! 2/17/2012 A Big Thank you to Souderton, CB East and CB South!! 1/22/2012 Suburban Aquatic League Champions! Congratulations to both the Boys and Girls North Penn Aquatic Club Teams on their championship wins! 1/2/2012 What Does it Mean to be a Knight? 11/6/2011 Congratulations Knights on a 2nd place finish at States !!! 10/29/2011 MAIDENS WIN STATE WATER POLO TITLE! 2011 CWPA Women's Varsity Division III Scholar-Athlete of the Year!!! "It�s time to dust off the Round Table. The Knights have come back." 3/6/2011 Congratulations to the North Penn State Qualifiers! 3/5/2011 North Penn Maidens Take 4th Place at Districts! 3/5/2011 North Penn Knights Bring the District 1 Crown Back Home!!! North Penn Captures District Crown! Knights back on Top as District Champs! 3/4/2011 NP Off to Golden Start at District 1 Swimming ! 2/18/2011 NP Knights are Kings of the Continental Again! 2/9/2011 NP KNIGHTS & MAIDENS KNOCK OFF EMMAUS!! Knights set TWO new Pool Records!! 11/8/2010 Knights take 5th Place in States! Maidens Take Second in State!! K&M Boys - Middle School State Champs! Sign-ups for Girls' Swimming & Diving team will be held on Monday, November 1 at 3:15 pm in room F125. Senior swimmers and divers are asked to arrive no later than 3:00 pm. If you are unable to attend, please see Mr. Weiser. 9/30/2010 A classic moment in the history on North Penn Water Polo !!!! 9/8/2010 Strong Start for NP! 9/1/2010 New PA Water Polo website! 6/26/2010 Announcing New PA Water Polo website! 3/21/2010 Congratulations to the State teams !!!!!! Maidens Take 7th Place at Districts! IN THE EVENT OF A POSTPONEMENT THE PLAN IS TO CONDUCT THE DISTRICT ONE BOYS AA & AAA DIVIING CHAMPIONSHIP FOLLOWING THE DISTRICT ONE GIRLS AA & AAA DIVING CHAMPIONSHIP. WARM-UP�S FOR THE BOYS COMPETITION WILL BEGIN AT 4 P.M. AND THE MEET WILL BEGIN AT 5:30 P.M. CONCERNING THE BOYS DIVING CHAMPIONSHIPS, NO DECISION WILL BE MADE PRIOR TO 1 P.M. FRIDAY AFTERNOON CONCERNING THE POSSIBLE POSTPONEMENT OF THE DIVING CHAMPIONSHIP. AN ANNOUNCEMENT CONCERNING THE STATUS OF THE EVENT WILL BE POSTED AFTER 1 P.M. ON THIS (DISTRICT 1's)WEBSITE. IN THE EVENT OF A POSTPONEMENT THE TENTATIVE PLAN IS TO CONDUCT THE DISTRICT ONE BOYS AA & AAA DIVIING CHAMPIONSHIP FOLLOWING THE DISTRICT ONE GIRLS AA & AAA DIVING CHAMPIONSHIP. WARM-UP�S FOR THE BOYS COMPETITION WILL BEGIN AT 4 P.M. AND THE MEET WILL BEGIN AT 5:30 P.M.
2/24/2010 Knights & Maidens Sweep Continental Conference! 'Ben Franklin never saw the North Penn boys swimming team. 2/3/2010 "The problem with being in the same league as a powerhouse like North Penn is that every season starts with the rest of the teams fighting for second place." 11/7/2009 North Penn Knights 2009 STATE RUNNER UP! 11/6/2009 GO NORTH PENN KNIGHTS! 11/2/2009 MAIDENS are STATE CHAMPS!! 11/1/2009 MAIDENS ARE STATE CHAMPS AGAIN!! 10/30/2009 BOYS' Swimming & Diving pre-season parent meeting 7-8pm on Monday 11/9 in room K-30. Come in the main entrance by the flag pole, take an immediate right. Any questions see Coach Daly. 10/23/2009 GIRLS� SWIMMING AND DIVING SIGN UPS will be on November 2, 2009 at 3:30 pm in room F123. Any questions see Coach Weiser. 7/10/2009 Athletic and Insurance Forms are due by August 17 - Schedule your physicals now! 7/10/2009 Announcing New PA Water Polo website! 5/21/2009 BALTIMORE, MD - Johns Hopkins water polo senior Josh Kratz (Lansdale, PA/North Penn 2005) has been named a Second Team ESPN The Magazine Academic All-District At-Large selection. Will He Make a Run for the 2012 Olympics? Congratulations to the following All League Team members! Congratulations to the following state qualifiers! 2/21/2009 Another Zac Attack at NP ! 2/14/2009 Knights Coast to Another SOL Title! 2/5/2009 Maidens tie with Emmaus Hornets! 11/10/2008 Congrats to the Knights on a successful season - 7th place !!! 2008 Pennsylvania State Water Polo Champions !!!! 10/15/2008 Knights & Maidens win State Novice Tournament! Locals make waves at States! on the road to States! 2/24/2008 Nees, Murray & Kohler headed to States! and Nicole Dibonaventura set a pool record! 2007 Pennsylvania State Water Polo Champions!!!! The Knights beat the Wilson Bulldogs 10-9 to win the championship! 10/19/2007 Check out our new Slide Show feature! Congratulations to the following qualifiers! Come June 2007, Her cap will say NAVY! The Knights beat the Wilson Bulldogs 10-8 to win the championship! with the final goal put in by Amy Plewinski! 10/20/2006 The Maidens complete a perfect divisional match record! Heading into States! 10/16/2006 Novice Tournament once again a success! Thank you to all the parents and upper classmen who helped out! 2006 Beasts of the East! 9/25/2006 COME OUT & WATCH! Be a part of the Blue Wave! the Knights place 3rd at States! 3/15/2006 Click here to follow the results from the PIAA championships. Ready for his last States! The District titles are on the line! SWIMMING DISTRICTS FOR BOTH THE KNIGHTS AND THE MAIDENS! Click here for some 'Pool Predictions' on the Maidens! Click here for one pick from each boys team for the Knights! will be representing North Penn at States for diving! District AAA Diving to North Penn High School! Congratulations to the North Penn Swim Team! 2/16/2006 Maidens in the news! 2/14/2006 Knights in the news! to complete an undefeated dual meet season! 1/12/2006 9 Year Old School Record Broken! Junior Katie Detwiler broke a 9 year old school record, January 10, 2006, in the meet against Pennridge for 6 dives with a score of 246.25! Way to go Katie! 11/6/2005 The Knights defeat Erie McDowell, North Allegheny and Cathedral Prep to make it to the Championship Round at the 2005 States Tournament at Cumberland Valley High School. They meet their rival Souderton head on with awesome play and great goal tending. "Great save by goal keeper, Joe Watts, who uses every body part to block the goal." After two 3-minute period overtimes and a sudden death period, the Knights place 2nd in the State. Congratulations to all the team; it truly was incredible! Congratulations to Brendan Fanslau who received the Mr. Water Polo Award and 1st Team All-State Honors. Kelsey Britton and Andrew Jaycox also received 1st Team All-State Honors. Tim McKeever received 2nd Team All-State Honors. Dan Dingman received 3rd Team All-State Honors. Way to go Knights! 10/25/2005 The Knights won an awesome match over the Wilson Bulldogs with outstanding defense especially Joe Watts in goal! 10/22/2005 A new photo upload & display capability has been added to the website for Water Polo matches and swim meets. If you have digital or scanned photos you would like to add to the site please contact Mercer Sisson for instructions. 10/9/2005 The Novice Tournament was a success in the new Natatorium! their time to make this the success it was. The NP Girls Water Polo 9th & 10th graders placed 4th. the championship game by Joe Watts. The evening also was a time to be proud of girls' coach, Bill Bartle, as he was inducted into the North Penn Hall of Fame for his accomplishments and service to North Penn. 5/15/2005 Coach Brian Faikish steps down from coaching swimming. He will remain as the Boys Water Polo coach. 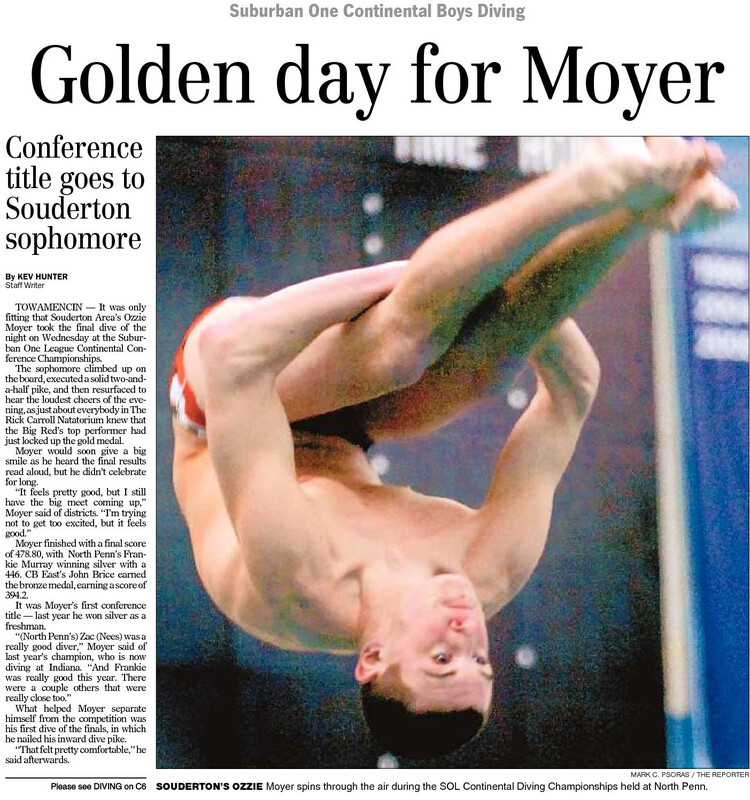 3/19/2005 A great State meet highlighted by a win in the 100 Breast by senior Adam Reynolds, and two top six finishes by divers, senior Josh Myers (3rd) and freshman Dan Schoendorfer (6th). 3/6/2005 Lead by senior Adam Reynolds' dramatic come from behind victory in the 100 Breast, the Knights come away with their 17th consecutive District I Title. Sending all three relays and numerous individual qualifiers, the Knights prepare to defend their State title. 3/6/2005 The Maidens placed 4th at a very competitive District meet and qualified all three Relays and two individuals for the State Championships. dual meet loss in 17 years. the Knights lose to Emmaus 112-74. 1/20/2005 NP Boys win their 250th consecutive dual meet! Congratulations to all the team members this year and years past on an historic achievement! 11/6/2004 The Knights are #1 in Water Polo as Well! complete the 2004 double championship. named to the 1st Team All-State team. named to the Honorable Mention All State Team. 10/30/2004 The Maidens take Fourth at Water Polo States. If you would like to help us maintain the information on this site your input is always welcome.